P.S. A great referral for me would be someone who brings in speakers for their organization. If you know someone who needs a speaker in the areas of Marketing, Mindset, and Personal Achievement, I’d appreciate it if you mention my name. Thanks! A message very similar to that goes out on all of the emails from Brian Hilliard. 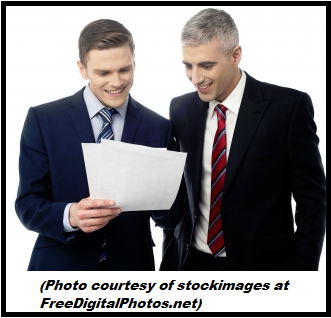 The number of referrals those simple words generate is surprising. If you really want to kick it up a notch, then consider changing your message every two or three months. This can be especially useful for people who work in industries that are seasonal. In March, you’re asking for one type of referral, and then in June, you’re mentioning a different one. Furthermore, this helps keep your message fresh and gets people to pay attention to your email signature! Referrals do not happen overnight. Referrals take a great deal of time and thought. It takes a good bit of energy put toward deepening the relationships of those around you. When you get organized and structure your referral-generating activities into a formalized strategy like we outlined above, you will absolutely find an increase in referral-based business. Good luck! What defines happiness and success? Everyone has a different answer, but I can tell you one thing that most would agree on: money does not solely define success and certainly cannot buy happiness. 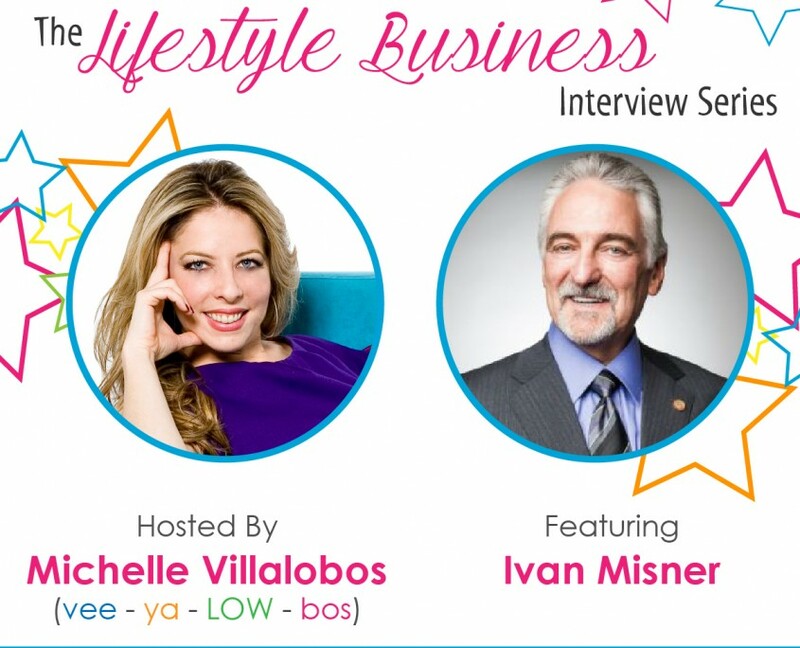 I recently had the opportunity to speak at the LifeStyle Business Summit, hosted by Michelle Villalobos. In telling her own story, Michelle said she was climbing the ladder like we all do, but when she examined her life, she in fact wasn’t happy–and so she left to find her own path to fulfillment. She started her own business, making upwards of $300,000 a year–which society tells us should make a us happy–but that as time went on, she had actually become what she disliked most in people and became the boss she herself had always feared. She never gave herself any breaks or time off, and sacrificed her own happiness and health for a corporate lifestyle. Two years went by and then Michelle realized she had to make a change in order to find true happiness. She wanted to run a business that revolved around her life and contributed something positive to the world–and she did, by changing her perspective, her business model and her definition of success. Michelle calls her new business model a “lifestyle business,” a term which I found fascinating as it resonated with some many of the concepts I talk and write a. In a lifestyle business model, you have to determine which things are satisfiers and which are dissatisfiers. Keep in mind that while money can be a quick satisfier, it often doesn’t lead to long-term happiness. Long-term satisfiers can be things like opportunity, recognition and working in your flame (finding you passion.) I’m a real believer in following your passion and finding things that are new and innovative within that passion to keep the flame burning. Dissatisfiers include things like working in your wax (not doing what makes you happy), climbing the ladder and yes–even money. A great example of this theory is a school teacher. A man or woman doesn’t become a teacher to make money, but to make a significant change in the world around them. I’ve known Wall Street executives who made millions, but admitted that their life was hollow. 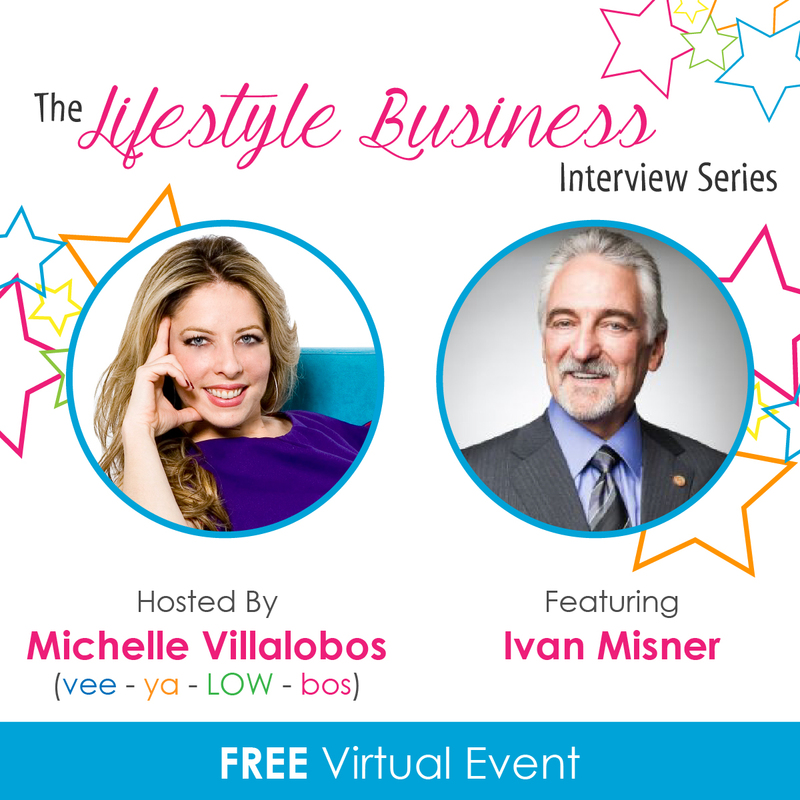 I strongly encourage you to join me at the virtual Lifestyle Business Summit on August 11. Register here to not only hear me, but several other top business and lifestyle experts talk about finding what truly makes you happy in your professional life. 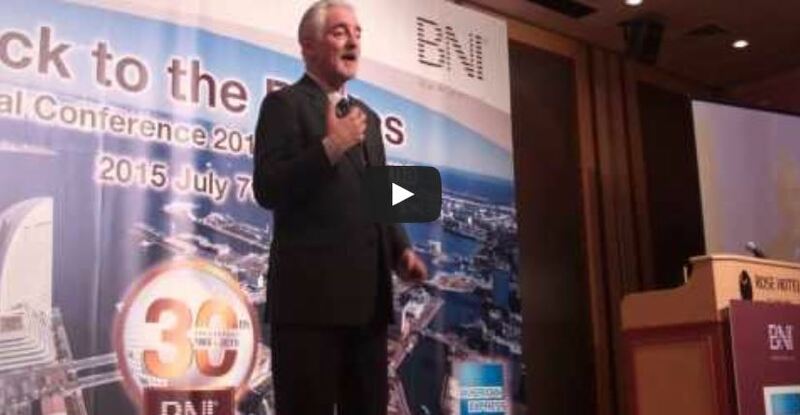 Public speaking can be a huge snag for so many business owners. 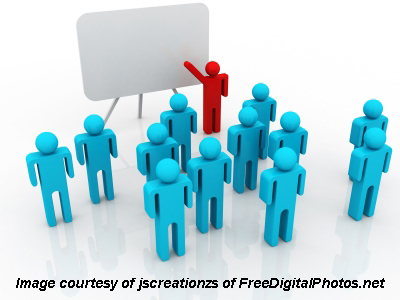 Even experienced and successful business owners often freeze up in front of crowds. 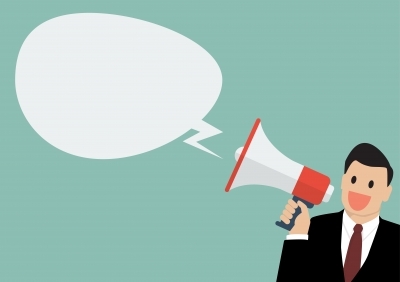 While public speaking may not seem incredibly important when it comes to growing your business, you may be surprised how it plays into your networking efforts. There are numerous ways to help reduce your stress when it comes to public speaking, and likely help with your business growth. Always be prepared. The best way to make yourself nervous is to try to get in front of a crowd and wing it. Take notes on what you plan to say, and have them handy. Walk the fine line between prepared and over prepared, though. Sometimes too much preparation can stress you out even more. Be specific. Don’t try to teach people everything about your business in one pitch. Focus on just one or two parts of your business each time you speak on it. By being specific, you can dive into something that you know well and feel at ease just out of familiarity with your content. Use visual aids. They help more than you think. PowerPoint slides can help keep you on track, and handouts can help you make sure that your audience can take home important pieces of information. Remember that you are the expert. Nobody else knows your business as well as you do. Don’t let your audience rattle you with questions. They simply want to learn about what you do, so help them do so. Be creative. If talking to a large group makes you uncomfortable, try starting with a Q&A and working from there. There is no right or wrong way to present to an audience, so do what works best for you and for your business. What are your tips and tricks for public speaking? Let me know in the comments below! When you want to nail a presentation, start by explaining your lowest common denominators, or the most immediate, universal value of your business. 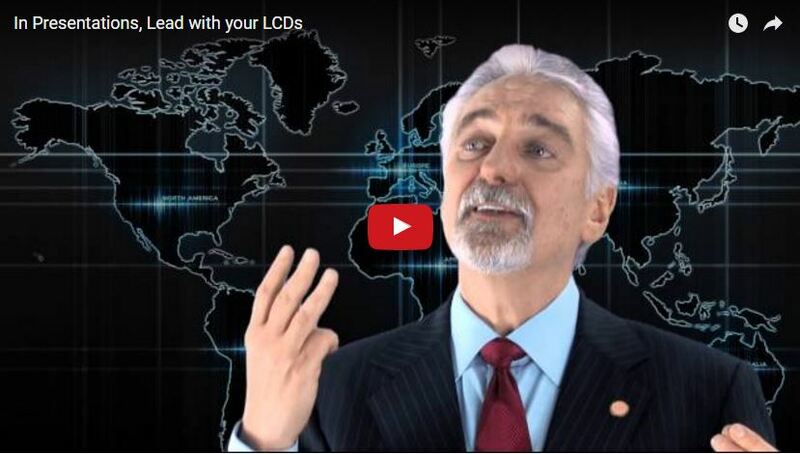 Your LCD is your secret weapon. Click on the graphic above, or click here, to see the video. All businesspeople know how vital a name tag can be for developing new contacts and presenting yourself professionally. That said, there are a few cardinal elements of a name tag that can really make or break its effectiveness. Name size. The whole point of a name tag is to allow people to see your name. Make sure your name is printed in a legible way – this includes making sure it is big enough for people to read! Company name. You’ll want to include your company name, your position, or both, on your name tag so that new contacts can connect you and your business together easily in their minds. We often recommend putting your name tag on your right-hand side, and high enough up to where it can be easily seen when someone is looking at your face, or chin. The lower you put your name tag on your shirt or jacket, the more awkward it will be when someone tries to strain to read it. I’m not a huge fan of those sticky, cheap paper name tags. They have their uses, but I like to carry a plastic or laminated name tag with me at all times so I never have to use one of those stickers. They come off very easily, get wrinkled, and are overall unruly. During one-to-one settings. This seems obvious, but you’d be surprised how often the name tag is put on for a group meeting, then is left on well after the meeting when the individual is meeting with someone one-to-one. When on stage. 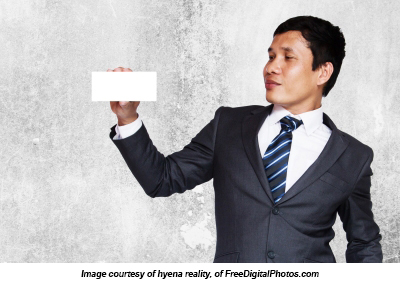 First of all, your audience will be so far away from you that they likely won’t even be able to read your name tag – no matter how big your make your name. The name tag can also distract from you and what you are saying, and often when you are on a stage in front of a large group you are giving a presentation that requires the audience’s attention. When on video. A primary reason for this is many cameras flip your image, so your name tag will be backwards, unreadable, and will very obviously be unnecessary to the individuals you’re speaking with. When in an intimate group. The exception to this is of course if every other member of the group is wearing their name tag, because your lack of name tag will draw (negative) unnecessary attention to you. However, in general, when a group is intimate enough to where you can easily remember everyone’s name and profession, or where you already know all of the individuals in the group, your name tag is unnecessary. What tips do you follow for your name tag? Let me know in the comments below! One of the most awkward parts of giving a presentation or lecture is the question and answer session after the main presentation. 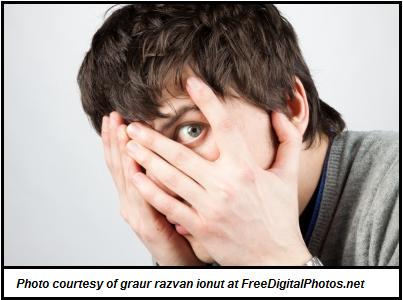 Not only is it awkward, it isn’t always necessary when it comes to business presentations. Of course, question and answer sessions may be beneficial when you are giving a “How to” presentation, and you want to ensure your audience fully understands the topic. You never know what kinds of questions the audience may spring on you. 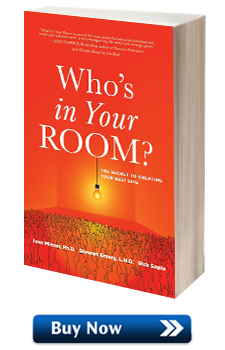 You could be the most educated person in the world on insulating a home, but there is always that person who will ask a question phrased in such a way to where you don’t know how to answer them, and your credibility with the group is destroyed. 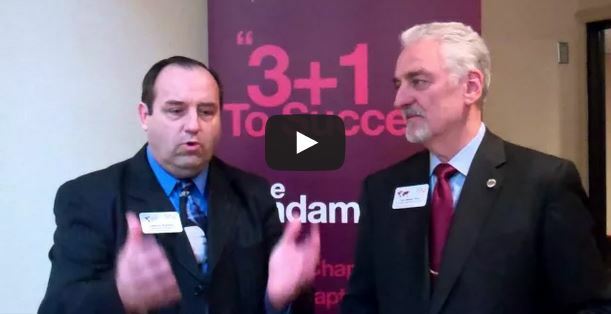 Questions people ask during a Q&A portion may be better answered during a one-to-one. One of the best ways to build relationships with a contact is by spending some solo time with them, talking about what you both do and getting to know each other a bit. Q&As can be time drains. Sometimes people do ask valuable questions during a Q&A, but many times the process of getting people to ask questions, and having some questions asked just be duplicates of each other, can really kill an event agenda. Your Q&A is not an open forum. Sometimes, audiences will use a Q&A time to air grievances, complain, express difficulties, etc., but this is definitely not the time that you would want to address issues like these. When you conclude a presentation, you should encourage your audience to speak to you after with any questions or one-to-one requests. This will give you an opportunity to hear questions, and address them individually, while developing relationships with potential contacts. Stranger Danger? Not in Networking! Why do people hate networking events? There are a few common reasons, but one that I have heard time and time again is an anxiety about introducing yourself to new contacts. I’m sure you’re familiar with the feeling of nerves as you meet new people and try to strike up a conversation. There are a few small things I think you should include in your introduction with new people that could help take the edge off. Don’t forget your name and your business! Because, yes, believe it or not this happens. I was at a networking event a few years ago, and someone came up to me. We spoke for a few minutes about their business and their experience using referral networking before they had to excuse themselves. It was then that I realized that I had never gotten their name, despite the fact that they knew mine. If your goal is to introduce yourself to a new contact and leave a lasting impression, definitely make sure you give your name. Find common ground. Finding something about your new contact that you can relate to is among the best ways to quickly develop the start of a relationship. This also will alleviate the pressure of your conversation with someone new, as it’ll spark topics you both can relate to and talk about. Be memorable. If you can stand out from the crowd and make yourself unforgettable (in a positive way! 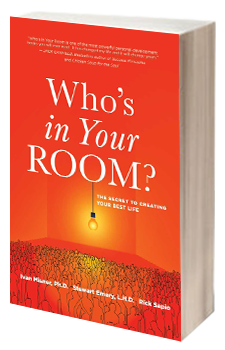 ), you’re more likely to really develop relationships. This is most effective when done when you are one-on-one with someone, and not in a group. Be sure to read the person, and use a quirk about yourself, your business, etc., that can resonate with the specific person. This one requires a bit of social intelligence, but when done right is highly effective. Ask questions about the other person. People love to talk about themselves and their business. Everyone has an easy time talking about things they know well, and what do people know better than themselves? Not only will this allow the other person to take the lead on the conversation in a positive way, it helps you learn about the other person. The caveat here is to make sure you are asking genuine questions. Asking nonsense questions just to keep asking questions is transparent, and will negatively impact how you are perceived. 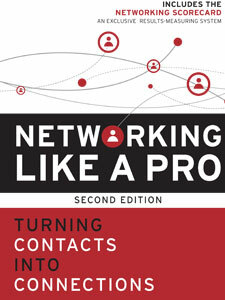 How do you handle meeting someone new at networking events? Let me know in the comments below! So You Want to Network Up? Earlier this week, I appeared on Copy Chief with Kevin Rogers as a special guest to talk all about referral marketing. If you missed it, you can check out the whole podcast here, but today I would like to specifically elaborate on one segment from the podcast. Around the 20-minute mark, I tell a story about a man named Mark who invested a lot of time and energy to develop our relationship. By the time he turned around and asked me for a favor, a least a year after we had met and begun our relationship, I was so appreciative of everything he had done for me that I was willing to do whatever favor he asked for. You need to be interested, not interesting. People don’t want you to sell to them, they want you to be interested in investing in them. If you’re networking up, or trying to network with someone very successful, you need to find a way to stand out. You need to make that powerful person want to help you, by expecting nothing in return. So how do you do that? It isn’t one of those things that you can just do overnight, or wake up one day and decide you’re going to develop a relationship with someone. First and foremost, you have to have an idea. A great idea. An idea that you can implement and it will positively impact the person you hope to build a relationship with. Something helpful, something that that person cannot do themselves. This idea should set you apart, and should be unique to both you, and to your future contact. Once you have developed your idea – and I mean fully developed; you can’t go to someone with a half-baked plan in your head – you need to reach out to the person that your idea benefits. Handwritten notes can make you stand apart. Emails and social media messages can work, but often will not help you stand apart, and depending on the person they may not be managing their own accounts. A well thought out handwritten note may be your best bet. From there, your strategy relies strongly on your idea and the person you are working to help. To hear me discuss some other related topics, check out the podcast with Kevin Rogers on Copy Chief here. This is content straight from my book Business by Referral and if you’d like to learn about the additional ten ways your network can promote you (which I share in the book but not in this video), click here for an article I wrote specifically on this topic. If you have any favorite tactics which you’ve personally found to be highly effective when it comes to putting your networking circle to work for you, please share them in the comment forum below. Thanks! The business I’m in involves a lot of coaching and guiding of franchisees to teach them how to coach and guide entrepreneurs, salespeople, and professionals to generate referrals for themselves and others. Sometimes this feels a little like ‘herding cats’; entrepreneurs hate being told what to do and it takes a real skill set to move them in a direction that involves a lot of hard work but will help them achieve the results they want. One of the biggest challenges I have in this process is not with the actual entrepreneur or salesperson but with the individual I’m coaching to be able to guide the entrepreneur or salesperson. These people have gone through many hours of training, tend to have a fair amount of field experience, and have support manuals that exceed a thousand pages of documentation to assist in the process. They are true experts. I’ve discovered, however, that sometimes expertise can actually be a problem. Just because your expertise may arm you with the knowledge to recognize the solution to a problem or challenge, it doesn’t mean other people are going to automatically ‘believe’ you know the solution and/or want you to actually tell them the solution. I know that sounds counter intuitive; however, if you’ve ever raised a child, you know that this is often times absolutely true! So, let’s say you’re an expert. You know you’re an expert. You know that you can help someone else. You also know that this “someone else” is a grownup who runs their own business or is an independent sales rep who chose their particular career for good reason . . . they like the freedom of being independent. How do you move these people in the right direction? I had a person who worked for my company who once went into one of my locations and was appalled by how badly things were being run by the members of the group. She let them know in no uncertain terms what they were doing wrong and how they needed to turn it around. Her assessment of the situation and the solutions she proposed were spot on but her presentation of them was all wrong. She was so blunt with the group’s members that she received a very negative reaction from them and ended up leaving the place an even bigger mess than it was when she first walked in. When I met with her to talk about how she might have done things differently, she grew furious with me for not supporting her since she was right and the members of the group were wrong. I wasn’t arguing that she was right–she was. The problem I had was how she handled the situation–in that area, she was completely wrong. I tried to explain this to her by sharing one of my favorite sayings relating to the dilemma: “Don’t burn down the barn to roast the pig.” In other words, don’t make things worse than you found them when you were trying to fix them in the first place. She could never really wrap her head around the concept that people may not welcome her advice with enthusiasm and agree with her stance on an issue when she was clearly right. She didn’t work for me for much longer (make of that what you will) and, eventually, we got an expert to work with that group who ‘listened’ to their issues, Built relationships with the group members, and then coached them into achieving the greatness they had within them. It’s important to note that this process took time and patience. There are two things I try to teach people in this situation. First, “people don’t care how much you know until they know how much you care.” If you want people to listen to you when you are coaching them or re-directing them, they have to know that you care about them and want them to succeed. If they don’t know this down to their core – they will not listen to your advice. Ever. Second, is a saying given to me by mother on a paper weight when I was about 16 years old and I was running an uphill battle for a student council race. My mother gave me this paper weight (which is still on my desk in my home to this date). The paper weight says: “Diplomacy is the art of letting someone else have your way.” When she gave me that, she explained that I had to learn how to work “with” people – not “through” people. She said that even if I did know the answer to a problem – it did no good if no one else believed me. That advice helped me win the election and it has helped me many times throughout my life. I have to admit that I don’t always use it as well as I can – however, when I do use it, things almost always go more smoothly. The bottom line is this: being right doesn’t help much if no one is willing to follow you. What are your thoughts on this issue? Maybe you can share a story . . . but, remember to keep it positive. Let’s focus on positive outcomes more than just horror stories. If the thought of giving a brief introduction of yourself and your business at networking meetings makes your palms sweat, read on . . . 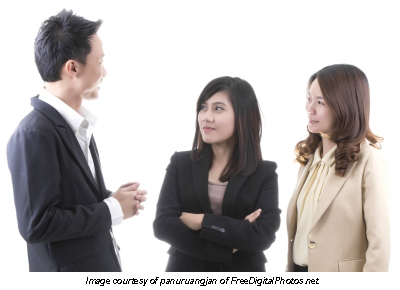 In many situations, you’ll be introducing yourself to only one or two people at a time. Some networking organizations have all the members stand at each meeting, and in round-robin fashion, give a one-minute overview to the entire group. If you’re a member of a group like this, it is vitally important to vary your presentations. Many people who are in networking groups that meet every week have a tendency to say the same old thing, time after time. From what I’ve seen, many weekly presentations are done weakly. If you don’t vary your presentations, many people will tune you out when you speak because they’ve already heard your message several times. Your best bet is to give a brief overview, then concentrate on just one element of your business for the rest of your presentation. I’d love to hear how it turns out for you–please come back and share your experience in the comment forum below. Or, if you’ve already done some things to help you with this issue – please share your tactics with us. Thanks!